The main highlight of this section is the spectacular Pochuck Boardwalk and bridge. The mile long boardwalk and 110 foot suspension bridge was 24 years in planning with seven years of actual construction at a cost of over $800,000. This is one of those must do sections of the AT that everyone can enjoy. This section of the AT is very popular and you can expect the side of County Route 517 where the AT crosses as well as the start of the boardwalk, packed with parked cars. There is a parking area that fits about 15 cars along Canal Road, just south of the AT. The GPS coordinates are N41 13.600 W74 28.114 for those who have a GPS devise in their vehicle. We suggest buying a copy of the Appalachian Trail Guide to New York-New Jersey for anyone planning a hike on this section of the AT. We have some info and a map of this section of trail below. This section of the AT begins where the trail crosses County Route 565. At 0.8 miles begin a sometimes steep descent. At 0.9 miles the trail levels briefly and then starts a steady, steep descent. 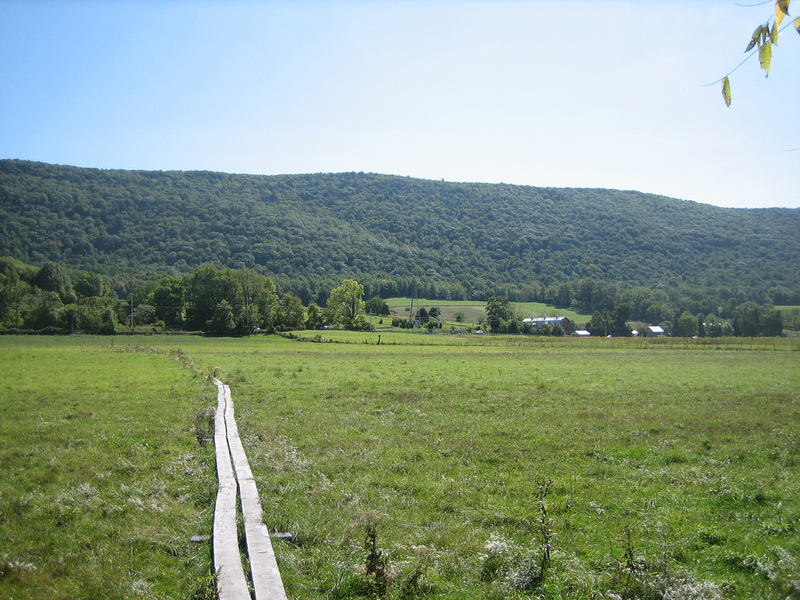 At 1.1 miles reach a view of Wawayanda Mountain. At 1.3 miles enter fields and trail levels. Cross wet areas across puncheons. At 1.5 miles reach and cross County Route 517. Pass a kiosk and the trail crosses a wetland along what is known as the Pochuck Boardwalk. The boardwalk is in the open with a brief wooded area, then the boardwalk is back into the open area. At 2.2 miles cross Pochuck Creek on a 110 foot suspension bridge. At 2.4 miles the boardwalk ends and the trail enters the woods. At 2.8 miles turn right on Canal Road and follow road over Wawayanda Creek, turning left back into woods at 2.9 miles. The trail will be crossing over numerous stiles during this next part of the trail as well as traveling through pastures. At 3.6 miles cross active railroad tracks and then over another stile into a cow pasture. Cross the pasture on puncheons and at 3.8 miles reach the end of this section at NJ 94. There is parking for over thirty cars near NJ 94 at this very popular trail crossing. The GPS coordinates are N41 13.160 W74 27.310 for those who have a GPS devise in their vehicle. Hiking guide with descriptions and maps for the Appalachian Trail as it travels in New Jersey. The guide is broken down by 9 sections of the AT. The book comes to you delivered as a pdf file via email. Use the buy now button and we will send you the file via email usually within 24 hours of receiving payment. 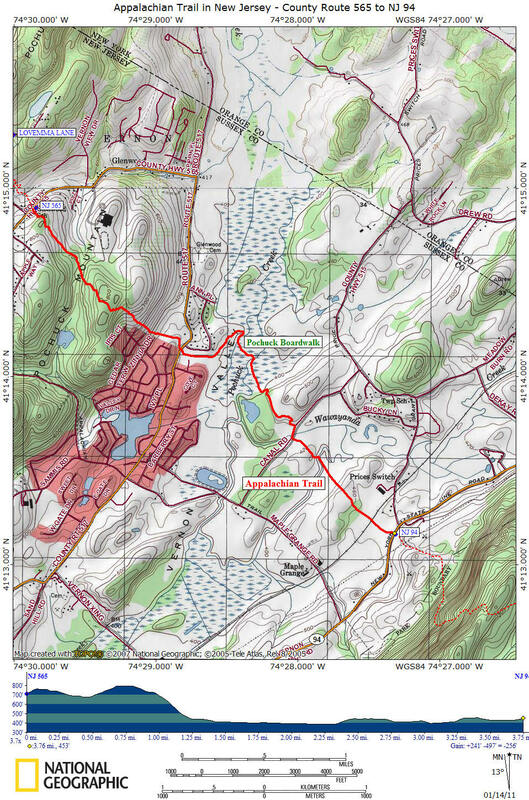 Hiking guide with descriptions and maps for just this section of the Appalachian Trail in New Jersey. The guide comes to you delivered as a pdf file via email. Use the buy now button below and we will send you the file via email usually within 24 hours of receiving payment. Happy Hiking!